When I lived in Spain a few years ago there was a mobile phone shop at the corner of my street. It was practically on my doorstep, they sold all kinds of phones and accessories and the prices were reasonable. But I always dreaded going in because buying anything there was a nightmare. The reason for that was that the shop assistant was always on the phone with someone else and would deal with customers without hanging up. It’s not that this happened once – it was every time. The person behind the counter would be on the phone but would try to deal with customers anyway. When I got to the front of the queue I’d explain what I needed, but the member of staff would be listening to both me and the person on the other end of the phone. When the shop assistant said something I could never be sure whether they were talking to me or the phone, and I never knew whether the person on the phone knew I was there. I always had to explain things several times, even when what I wanted was simple. If I was lucky, the phone call would end before my conversation and for the last minute or so the member of staff and I would be able to understand each other properly – bliss! Now, this is not a rant against the shop staff. It wasn’t their fault, and it must have been far more stressful for them than for me (imagine dealing with two people at once, one face to face and one on the phone, for eight hours every day). The point is this daft company policy made things frustrating, confusing and a waste of time. Why am I telling you this? 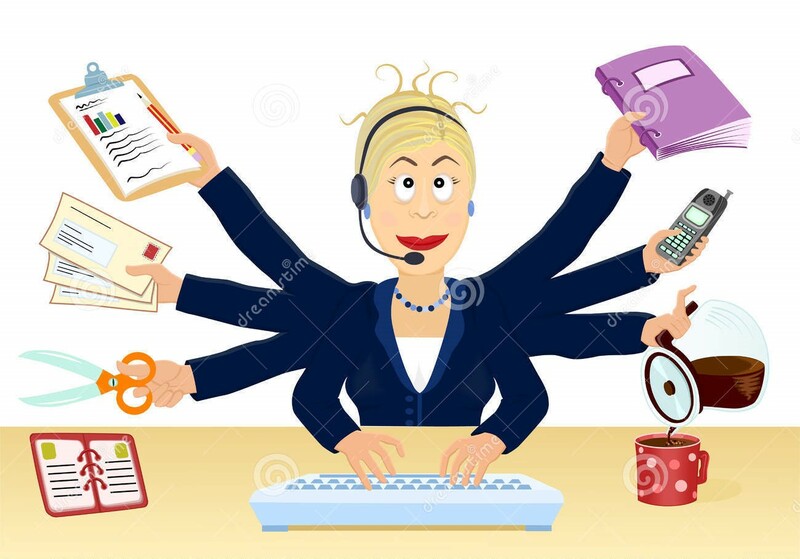 To make the point that multitasking is not an efficient, modern way to operate but a great big con! And this isn’t a gender thing. We all know the jokes about how men can’t multitask, but here’s the truth: human beings can’t multitask! Making a virtue out of multitasking the way we do is a huge mistake. We think we’re saving time in our busy lives, but both psychologists and neurologists agree we’re not actually doing two or more things at once, we’re doing them in sequence, switching between them, so we’re not saving time at all. In fact, trying to do several things at once actually wastes time because being distracted from one activity by another disrupts our concentration and we take a while to get our focus back each time. Don’t get me wrong, I’m not saying it’s never possible to do more than one thing at once. I’m sure Gerald Ford actually could walk and chew gum at the same time, and so can I. Why not listen to music, or the news, or a podcast, while you check your email, do some housework or go for a walk? It does mean you have slightly less attention for each activity, though, and in fact that’s often the idea: in the examples I’ve just given you’re probably doing the first thing to make the second less boring. What you shouldn’t do is kid yourself you can do two things at once and be properly focused on them both. I think part of the problem is that we feel virtuous when we think we’re multitasking because, quite wrongly, we think we’re saving time. Also, we live in a culture that says busy equals popular and cool. No one wants to admit to having downtime in case other people think they’re a sadcase. But here’s the thing: you’re not a teenager any more! You don’t have to bother with that superficial rubbish these days! *I recently read some good advice about how not to make people hopping mad by doing this: if you’re in a situation in which you wouldn’t go to the loo without making your apologies, that’s probably also true of doing anything with your phone. ← Whatever happened to proper news?